One thing experts agree on: The longer Lansing takes to find a solution for Michigan’s crumbling roads, the more expensive roads become to repair. March 1: Michigan roads are a big mess. Here are eight big ideas to fix them. Michigan doesn’t have enough money to adequately fix its roads. That’s the conclusion of more than one recent study, and it was echoed last week by Paul Ajegba, the new director of the Michigan Department of Transportation, who pegged the annual funding gap at $1.5 billion until about 2031 — and that’s just for state highways. That doesn’t include local streets, whose upkeep is the responsibility of counties and cities. 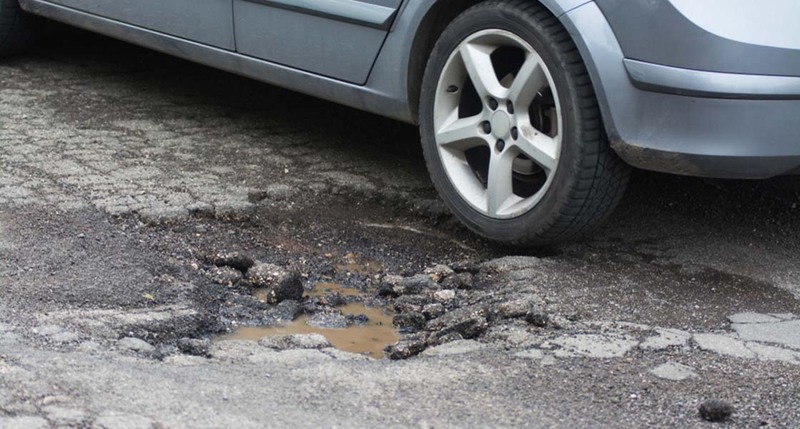 If funding doesn’t increase, MDOT warns, Michigan drivers should get used to potholes: More than half of state-maintained roads are projected to be in poor condition within the decade, considerably more than today. That’s even with the infusion of up to $1.2 billion by 2021, a legislative road-funding fix that experts say is not a sufficient number. On Tuesday, Gov. Gretchen Whitmer will offer the latest glimpse of her plan to fix Michigan’s roads — a signature campaign issue for the East Lansing Democrat, who vowed to pump new money into roads — during her inaugural State of the State address. More specific details about how she’ll pay for it are expected when she submits her first budget next month. For now, Whitmer’s appointee to lead the state transportation department argues the evidence is clear that Michigan’s years of underinvestment in roads means the state must pay billions more than it spends today over a decade if it’s serious about wanting roads in good shape. Before the road-funding debate begins in earnest in Lansing, a primer on all things road funding: Where the money comes from, where it goes, how much more is needed. Where does Michigan get its road dollars? Three taxes are charged on the sale of gasoline — a federal gas tax of 18.4 cents per gallon (24.4 cents for diesel), a state gas tax of 26.3 cents per gallon and the state sales tax of 6 percent. Revenue collected from federal and state gas taxes is spent on roads. The sales tax, which is charged on the combined retail fuel price and federal gas tax, does not go to roads. Instead, nearly three-quarters of sales tax revenue collected on fuel sales goes to the state’s School Aid Fund, with the rest split among local revenue sharing, public transit and the state’s discretionary general fund. In addition, fees charged to register vehicles with the Secretary of State rose by 20 percent in 2017, as part of the 2015 legislative road-funding package. The fees vary based on the vehicle, but the nonpartisan House Fiscal Agency said in 2015 that the average registration fee for a passenger vehicle was close to $100 before the increase. 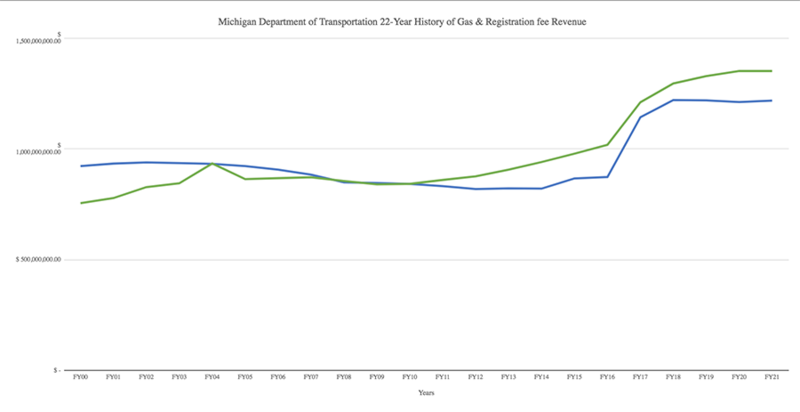 Vehicle registration fees have generated more revenue for the state than gas taxes since 2010, though MDOT said gas tax revenue is surpassing registration fees this year with the recent increase and the two funding streams are projected to be close to equal in future years. Gas tax revenue rises and falls with consumption, so if drivers fuel up less — for reasons ranging from high gas prices to better fuel efficiency and more battery-powered vehicles — less gas tax revenue is generated. That is one reason gas tax revenue fell during the 2000s, according to the nonpartisan Senate Fiscal Agency. 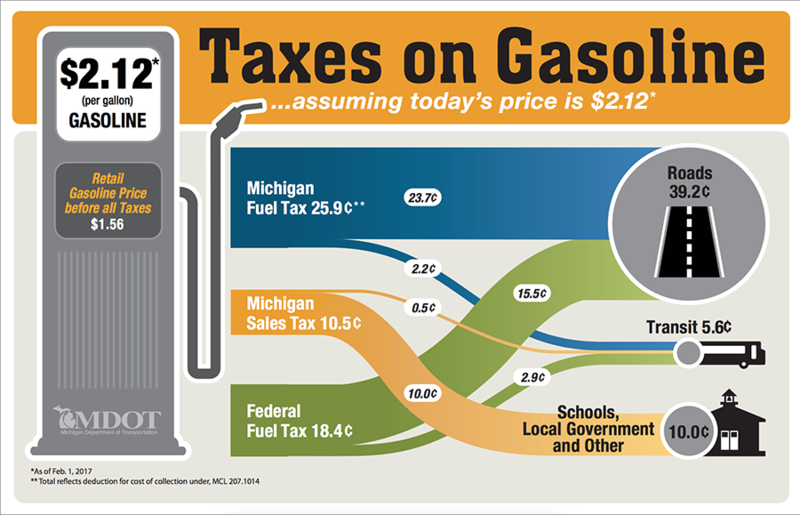 Michigan’s gas tax isn’t tied to inflation, which limits revenue that otherwise goes to road repair. When lawmakers hiked it to the current 26.3 cents per gallon effective in 2017, that was the first state gas tax hike since 1997. That will change in 2022, when the state gas tax will be linked to inflation. The federal gas tax has not been raised since 1993. Revenue from state gas taxes and vehicle registration fees is shared with various programs, including rail, public transit and economic development, before it’s divided among the state, cities and counties to spend on roads through a formula created under Public Act 51 of 1951. The state and counties each get 39 percent of the funding, while cities and villages receive 22 percent. Policymakers, including former Gov. Rick Snyder, questioned whether the Act 51 formula remains the best way to dole out road dollars to state and local governments. Michigan also receives about $1.1 billion annually in federal road dollars, 75 percent of which goes to fund state projects, according to MDOT. The remaining 25 percent is divided between counties and cities. In 2016, the Snyder-appointed 21st Century Infrastructure Commission estimated Michigan needed to spend $2.6 billion more per year just to maintain all of the roads and bridges the state has today. Ajegba, the new MDOT director, pegs the additional amount MDOT needs to fix roads the state maintains — freeways, state highways and interstate business routes — at roughly $1.5 billion per year until about 2031, the year MDOT projects 90 percent of state-maintained roads will be in good and fair condition. In 2015, the state Legislature adopted a $1.2 billion road-funding plan that, when fully phased in by 2021, will generate $600 million annually through diverted income taxes and the other half from increased gas taxes and registration fees. Snyder and lawmakers also put surplus state dollars toward roads. Republican legislative leaders at the time praised the package for its mix of existing revenue and new money, but it has been criticized since as an insufficient amount. At his confirmation hearing last week in the state Senate, Ajegba said that $1.2 billion was needed just for state-maintained roads, but the $1.2 billion lawmakers passed had to be divided among the state, counties and cities under Public Act 51. That left MDOT with just 39 percent of the amount it needed, Ajegba said. Even with the $1.2 billion, MDOT estimates roads will continue to deteriorate without new funding. 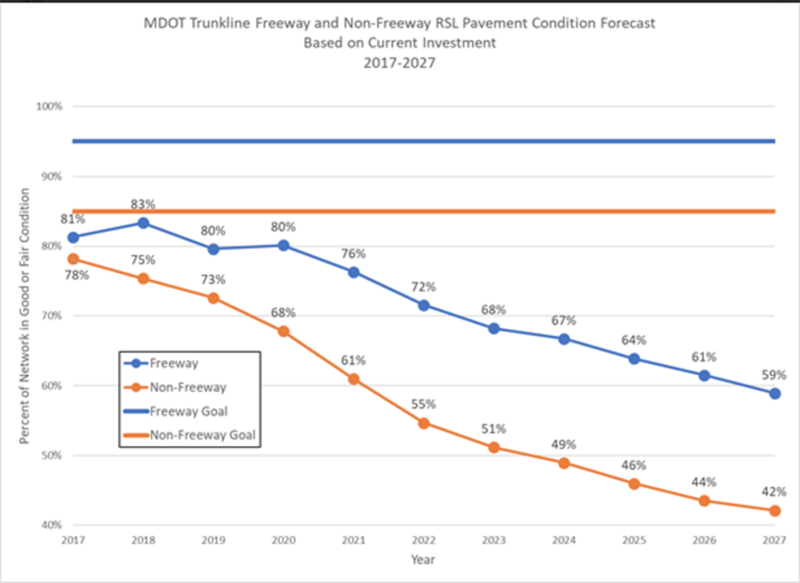 Projections show that at current funding levels, 59 percent of state freeways will be in good and fair condition by 2027, down from 83 percent in 2018 and far from the federal standard of 95 percent. The state maintains close to 9,700 miles of freeways, two-lane highways and interstate business routes. Michigan’s 533 cities and villages and 83 counties have jurisdiction over local streets. But counties and cities both rely on state funding for roads received through the Act 51 formula. Cities also receive state revenue sharing they can spend on roads, but that money also funds other local services, such as public safety and parks. Local revenue sharing has been cut over the years. “In our opinion, there is no question there is a significant gap in terms of the revenue we get today or the revenue we’re projected to get under the 2015 package and what we need,” said John LaMacchia, assistant director of state and federal affairs for the Michigan Municipal League, which works on transportation and infrastructure issues affecting local governments. Property tax millages have become more common in recent years as cities try to pay for road repairs while saving general fund dollars for other city services, he said. Local government advocates say they want Whitmer’s administration to dedicate more revenue to roads from a sustainable funding source, though they aren’t proposing a specific solution. LaMacchia said the Municipal League is waiting to see more details in Whitmer’s roads proposal to evaluate. In Grand Rapids, city residents and non-residents who work in the city pay a local income tax, which breaks down to $20 for every $10,000 in annual taxable income, according to the city. That generates about $13 million a year for local streets, said Eric DeLong, deputy city manager. Several years back, a city task force determined the city needed about $22 million a year for 15 years to get 70 percent of its roads in good or fair condition, he said. So in 2014, city voters approved a 15-year local income tax of 1.5 percent for residents (0.75 percent for non-residents who work in the city), with 0.2 percent of that revenue dedicated to streets and sidewalks, intended to yield $9 million annually. The result was dramatic. In 2014, 37 percent of the city’s roads were in good and fair condition, he said. Today, that’s up to 60 percent. What options will raise road revenue in Michigan? Gas taxes are often supported as sources of road funding because they’re essentially user fees, paid by drivers who use the roads. But they’re also problematic as a reliable source of future revenue because they are consumption-based in an era of improving vehicle fuel efficiency, and amid predictions of more electric and hybrid vehicles on the road that rely more on battery power and less on gas. A bipartisan group of former legislative leaders, led by Republican former Senate Majority Leader Ken Sikkema and Democratic former Senate Minority Leader Bob Emerson, proposed increasing the state’s gas tax by 47 cents over nine years, to raise close to $2.5 billion. (Disclosure: The group is funded by The Center for Michigan, a nonprofit that includes Bridge Magazine.) Sikkema and Emerson told Bridge the proposal is an effort to jumpstart a road-funding conversation and is not a definitive solution. House Speaker Lee Chatfield, R-Levering, has said he wants to discuss dedicating the 6 percent state sales tax paid on gasoline to roads. Currently, that money primarily goes to K-12 schools; Chatfield has said using that money for roads would not affect schools, though he has not yet offered specific details on how to make up lost school funds. Senate Majority Leader Mike Shirkey, R-Clarklake, has said he wants to wait until the full $1.2 billion package is phased in before evaluating what more might be needed. Neither Republican leader has indicated an appetite for raising more revenue to fix the roads. That contrasts with Whitmer, who campaigned on fixing Michigan’s roads and proposed generating $2 billion per year through higher fees, or through bonds if the Legislature chooses not to raise fees. She has not yet released specific details of her road-funding plan ahead of her 2019-20 budget rollout in March. Other ideas, from toll roads to assessing mileage-based fees, have not gained much traction. Vehicle-miles-traveled fees are still being tested in states like Oregon, and tolling comes with federal and other considerations. Ed Noyola, deputy director of the County Road Association of Michigan, said it’s the Legislature’s responsibility to debate the merits of the various funding sources, including how changing one area could affect another — including decisions such as how K-12 school funding would be replaced if the sales tax on gasoline is shifted to roads. LaMacchia, of the Municipal League, said the state could choose to allow municipalities to create local sales or gas taxes that could be used to fund local street work. Here’s an idea that doesn’t cost a cent. Lower the weight limit of trucks and STRONGLY enforce existing weight limitations. Oh, wait. Stupid me. That would go against the truck lobby, and that would cost campaign contributions. So while we have the worst roads, we have the best paid legislature. I don't disagree with your premise, but who are these people you know with both the authority and the inclination to enforce the limit free of charge? Show you what happens with NO bid contractes and crooks in MIDOT!!!! How come divison hwy lasted over 50 years,,, I-75 over 40 years BUT i696 only 20 years<<<< Our NEW Ag needs to go after the people who filled their pockets on OUR road money!!! Provide some facts to support your statement! Road construction projects are all public bid. Look, higher taxes with a disappearing clause, that funds a large infrastructure rebuild, and creates thousands of new jobs would pay for itself throughout the State of Michigan economy. Betsy DeVos and others like her should pay their fair share of taxes. She could sell just 2 of her 10 Yachts to completely fix the roads. NO new taxes unless you tax the rich. The ordinary working poor has nothing left to give. In truth, we all need to pay more taxes. My own street is 40 years old and a real mess. We neighbors must ourselves pay to fix this county, residential street. Some want to know why they pay taxes if nothing gets fixed. I remind them they keep voting for lower taxes. Especially if government, state and national, no longer expects corporations to pay their share. The corporate tax needs to be raised back up (they didn't even eliminate the loopholes), the rich must pay a much higher percent, and all the rest of us must also do our share. My neighbor tells me we now spend, as a country, more on our electronics than on education. Seems the only one doing well is Apple. Better yet we should kick them out of our state!!! Who needs her and her like here! "Michigan’s gas tax isn’t tied to inflation, which limits revenue that otherwise goes to road repair. When lawmakers hiked it to the current 26.3 cents per gallon effective in 2017, that was the first state gas tax hike since 1997. That will change in 2022, when the state gas tax will be linked to inflation." "The gasoline tax of 19 cents a gallon will increase by 7.3 cents and the diesel tax of 15 cents a gallon will go up 11.3 cents, WITH AUTOMATIC ANNUAL INFLATIONARY ADJUSTMENTS IN 2022 AND AFTER. Vehicle registration fees will rise 20 percent. The measure also permanently shifts existing state funds toward road work starting in two years." This is why people don't trust either Lansing or the people peddling another gas tax hike. Did you think that people would miss the fact that the republicans added a perpetual gas tax hike that kicks in within three years? Somewhere Michigan citizens are entitled to the facts on whether the heavier truck limits in Michigan are responsible for faster wear/damage in this state to the freeways and other major highways. Theoretical models may be somewhat persuasive but more valid are observational studies. Perhaps 99%+ of wear/damage on roads is due to heavy trucks. More money is needed for roads. It probably past time to initiate sales taxes on some kinds of services. In the end, it's all about politics--I'd just soon the other guy pay taxes or the public goods game. Why hasn't there been any discussion about making select stretches of Michigan highways toll roads? Neighboring states - Indiana, Illinois, Ohio, Pennsylvania, West Virginia - have them, and their roads are in excellent condition. What impact would changing weight limits and frost laws have on our roads? Why not limit the damage being done to our roads in the first place?? How come roads built in the 50 and 60 last over 50 years BUT roads built under Engler and GrandMold only last 20 years<<<< Davison what lasted over 50 years and was rebuilt less them 10 years ago allready has pot holes!!! !